This is crazy; these guys are really moving when a deer comes out of nowhere and gets tackled by a long-boarder. One of the fellow boarders yells "that was so f'in radical" and then he says "is that dude alright" Anyhow, watch as he takes quite the spill! 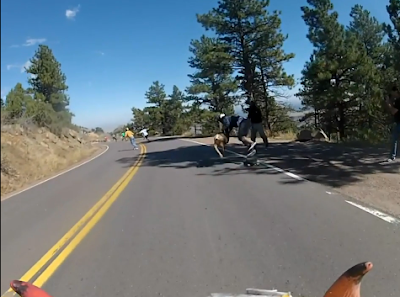 The racers were taking part in the 2012 Buffalo Bill Downhill Bloodspill on Saturday, a 1.1-mile race with competitors reaching top speeds of 40 miles per hour on their long skateboards, according to the competition website. Neither the deer nor Ryan Vitale, the skater, were seriously hurt. Paproski said Vitale suffered some bumps and bruises but no broken bones. As for the deer, it apparently survived.